Being eight metres high, the world’s tallest vase is an exhibit at Castle Leuchtenburg. New on the exhibition tour! It is an old adage... broken crockery is a sign of fortune! Discover the thrilling and secret places by audio guide. Castle Leuchtenburg accessible for everyone. Uncover the 1000 year old Castle’s history and the mysterious White Gold. The White Gold invites you on a discovery tour through different areas like "The Prologue", "The Unknown", "The Enigma", the world's tallest vase and the world's smallest teapot. Explore “The Precious” experiencing modern lifestyles of people that lived in the Leuchtenburg Castle. At the end you will discover "The Familiar". Adventure through the “Archive of wishes” where you will take a porcelain plate where your wish will stay when you release it into the “Skywalk of Wishes”. Discover the thrilling and secret places at Castle Leuchtenburg as well as the Porcelain Experience by audio guide. Seven interactive worlds of experience will be completed by the porcelain church. The chapel is the first porcelain church and meant to be a place for holy services, baptism services, weddings as well as a room for relaxation and different concerts. Ecumenical services are held here regularly. Discover the gift shop with many gifts you could share with someone important to you. Book adventure tours around the Leuchtenburg Castle. Travel through our special restaurant in which you can book one of our set brunch buffets. We also have many events that we will be hosting so stay tuned! The Visitor Centre welcomes its guests. Here you can obtain your Castle and event tickets, visit our shop, get some advice and find interesting toilets. And: you can take a rest and try our delicious refreshments from our snack bar. Thuringian cuisine meets the latest style of cooking. Here, you can dine in traditionally medieval charm. This important anniversary will be celebrated in Bauhaus tradition at its best in 2019. Castle Leuchtenburg will show design treasures that have never been exhibited before and come from a remarkable collection: German porcelain design en route to contemporary art. Medieval tournaments and pageants on castle Leuchtenburg. Easter attractions with a difference - an event for kids and families. A world of jugglers, lights, craftsmen, musicians and princesses. Christmas smells sweet, jingles and twinkles – especially on Castle Leuchtenburg. During the second and third weekend of the Advent season, from 11 a.m. until the evening, the medieval Castle invites you to see our X-mas market of wishes – offering events and activities for the complete family. Children younger than 6 years as well as birthday kids up to 16 years enter for free. The ticket allows you to visit the complete Castle together with its exhibitions and the Porcelain Experience. Dogs very welcome! But please guide them on a lead and see that nobody else will be impaired by them. A dog bowl is available in front of the Castle Tavern or simply ask our service staff. There is a free car park for our guests at the foot of Castle Leuchtenburg by the roundabout! Sufficient parking spaces are available both for cars and for buses. One e-mobility charging station is available directly next to the Castle Gate. Charging is free. Enjoy the way up to Castle Leuchtenburg on foot. Castle Leuchtenburg is accessible for people with restricted mobility! Disabled or handicapped persons are allowed to drive up to the Castle and park in front of the Castle Gate. The Jena - Saalfeld train stops at Kahla train station. Our Porcelain Experience is accessible for people with restricted mobility. 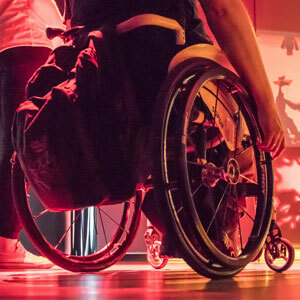 Disability badge holders are eligible for admission at the concession rate of 11,50 euro. Any registered accompanying person will enter free of charge. Assistance and guide dogs are welcome. All new exhibition rooms of the "Porcelain Experience" are wheelchair accessible. A lift will take you to the porcelain treasures and from there visitors with restricted mobility can continue their tour via wheelchair access. In addition to that, our Visitor Centre with its snack bar and terrace as well as our conference hall at the Gate House Hall are also accessible for people with restricted mobility. A lift is also available at our Castle Tavern. There are three disabled toilet facilities on the Castle premises (on the ground floor of the Gate House; on the first floor of the Gate House by the conference room as well as on the ground floor of the Lodging House at the Porcelain Experience). To our visitors with restricted mobility using wheelchairs, we recommend an unforgettable impression of the Castle via the easy-access Panorama Path whose horseshoe-path leads to the Castle and offers striking views. The surface of the Inner Bailey has been renewed with shell limestone material and now provides equally easy-access and movement for wheelchair-users with an accompanying person, rollator-users and people with push-chairs. Wheelchair-users are allowed to drive up to the Castle and leave their cars at the forecourt. Please do not hesitate to contact us. We will be happy to assist you any time. Your ticket is a day ticket and allows you to visit the complete Castle Leuchtenburg together with its exhibitions: The Castle Well, the Castle Keep, the Porcelain Experience, the Porcelain Church, the medieval fortifications, the exhibition related to the times when the Castle served as a court and prison, the wine cellar as well as the Skywalk of Wishes from which you can throw a ceramic plate into the depth are all included in the ticket price. On your tour around Castle Leuchtenburg, you will be able to get an insight into the history of the Castle as well as immerse yourself into the Porcelain Experience. Watch out for funky, extraordinary and miraculous things awaiting you within the old and new walls. At the award-winning Porcelain Experience you will be taken on a journey through time around the history of porcelain. Take a stroll through the jungle of porcelain myths, see a Chinese shadow play, and marvel at historic and modern wonders at the Hall of Curiosities before you can then lift the secret around the porcelain itself in the Alchemist’s Room. At the kiln you may be lucky to create a masterpiece using the bellows correctly or you might end up in front of a pile of broken fragments of china. What is going to amaze you for sure is the world’s tallest vase that - with its height of eight meters - we have placed next to a three-millimetre tea pot to make the contrast clear. 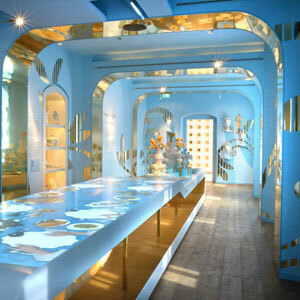 The banqueting table glistening in light-blue and gold splendour is now in front of you with an exquisitely set table on which you can see a sugar-art-cake and then the Porcelain Hall showing off the richest treasures of the 250-year-old porcelain history in Thuringia. After looking at the milestones of porcelain history dating back 100 years, at the Pink Labyrinth, an emotional finale of the Porcelain Experience tour will unfold itself in the Archive of Wishes and on the “Skywalk of Wishes” that is standing out 20 metres from the Castle Mount and from where broken crockery will turn for you into fortune. If the weather is nice, you will be rewarded with beautiful views from all corners of the Castle and can catch some sun rays. For this, we highly recommend taking a walk on the Panorama Path around the Castle welcoming you with plentiful resting places, sun terraces by the Gate House as well as the Visitor Centre and in front of the Castle Tavern, and – to cap it all – do not forget our Skywalk of Wishes! After a short break, head on and uncover the old Castle with its fortifications including the scary martyr tower, the wine cellar, the cellar with the head alive, a piece of art by Alim Pasht-Han, the Knight’s Hall and the 80-metre-deep Castle Well. Those of you who want to enjoy the mesmerizing panoramic view from the Castle Keep, will have to climb 151 steps. Peace and silence can be sought in the Porcelain Chapel that has now been newly laid out and consecrated in ecumenical manner, based on a more than 500-year-old tradition. The designs are originals by Michael Brown, a scholar of Libeskind. Make your tour complete by trying our delightful refreshments at our Castle Tavern or the snack bar and simply enjoy the landscape around you! Why do I have to pay admission if I only want to visit the Castle Tavern? In 2007, Castle Leuchtenburg was meant to be sold by auction. At the time, 60% of all buildings at the Castle were empty and in desperate need of repair. A concept for use did not exist. For that reason, we decided to establish a non-profit foundation from our own ranks (the tenant of the Castle Tavern Sven Erik Hitzer) with the aim of making every possible effort to gain funds and use own equity, to develop ideas for the revival of the complex and, fortunately, have been able to implement these ideas step-by-step. For a period of seven years, there had been extensive construction works at Castle Leuchtenburg. Now we have accomplished re-opening all parts of the Castle and we are very proud to say that eventually all buildings have been brought back with life and are open for the public. Since 2014, we therefore charge an overall admission fee for Castle Leuchtenburg, since all parts of the Castle – including those that have formerly been without admission charge - have something to explore. This includes the 80-metre-deep Castle Well, the Gate House with sun terrace, our Skywalk of Wishes as well as the complete Porcelain Experience with its world-tallest vase. Admission fees secure the preservation of the Castle. To visitors from surrounding areas or those who would wish to see Castle Leuchtenburg and its restaurants regularly, we recommend the purchase of an annual ticket at only 25 euro. A membership in the Förderkreis der Leuchtenburg is a priceless alternative option to get free admission all around the year: a 30-euro annual fee or 15 euro for senior citizens and family members of membership holders. We also organise a barbeque event once a month that includes free admission of the Castle and all its exhibitions from 5 pm and on which days the refreshment areas are open until 9 pm. Evening events at the Castle Tavern that are without a visit to the Castle are free of charge as well. What can kids do at the Castle? You think porcelain is boring and kids might break a lot in a museum like this? Taking part, touching and having fun is what we explicitly want you be motivated about! Castle Leuchtenburg, its exhibitions and refreshment areas have been awarded the Fair Family Award of the Verband kinderreicher Familien (Association Of Families With Many Children) as well as with the label "Familienfreundlich" (family friendly) of the Hotel- und Gaststättenverband (German Association of Hotels and Restaurants). Kids are particularly fascinated by operating the water wheel at the 80-metre-deep Castle Well or by listening to the scary stories at the martyr tower told by speaking stones. How many steps are leading up to the Castle Keep? Kids will find out! At the Porcelain Experience, kids love discovering our fantasy animals. They also love watching the shadow plays depicting the adventures of farmer Deng and his dragon and watch the living wall in the Hall of Curiosities with astonishment. Kids love exploring the secret mixture of porcelain compounds by using the scale pans and baking their own vase in the kiln with noisy bellows. They will ponder in front of the world’s tallest vase that has been painted with 360 nature illustrations and measures 8 metres in height: kids’ hands would have to stack 80 hot chocolate mugs to reach as high as this – even a giraffe were smaller if placed next to the vase! The Skywalk of Wishes is a special highlight, where kids, after first writing a secret wish with magic paint onto a plate, can then throw it into the depth listening to the rambling sound: broken crockery is a sign of fortune! You are welcome to hire or download the audio guide for the kids’ Castle and Porcelain Experience tours, either on our premises or free of charge from the App-Store or Google-Play-Store. Also see our Castle-owned goats and sheep along the Panorama Path to make kids happy (during the winter months you will find them in their sheds along the moat). Are EC-/credit cards accepted for payment? EC- and credit cards are accepted for purchasing your tickets or items in the shop. The snack bar and Castle Tavern accept EC-cards. You can make use of the free WLAN system at the Visitor Centre, the Castle’s refreshment areas as well as in the conference room at the Gate House. Of course! Special moments, surprising things or anything that leaves you mesmerized: please take photos, record videos, write blogs etc. We will be pleased if you share your impressions with your Facebook-friends or your Instagram-community. THANK YOU! Why are there also modern buildings on the premises? "When it comes to construction, everyone designs in their own era...!" These was fixed by representatives of monument preservation back in 1964 in the „Charta of Venice“, and in accordance with these conventions the Foundation Castle Leuchtenburg together with the Landesamt für Denkmalpflege (Authority for the Preservation of Cultural Heritage) have been re-designing the further development of Castle Leuchtenburg. In 2012, the Visitor Centre was opened in a new building on the forecourt, followed by the control centre and the northerly extension of the Lodging House together with the Skywalk of Wishes in 2014 and 2015. Your tour around the Castle will allow you to see evidence of construction work that is as old as 800 years. Since its first documentary mention in 1221, the Castle has been adapted to its use leaving interesting architectural marks: Castle Leuchtenburg used to be a centre of administration from 1395 to 1710. The Fortifications, the main building as well as the Castle Well have their origins in that era. In 1720, extensive renovations started to make use of the Castle as prison, workhouse and lunatic asylum. By 1871, the Castle had counted 5,200 inmates. To date, the Outer Bailey still has clear signs of prison architecture. The Gate House used to be a barracks, built around 1840, the large building opposite of today’s Castle Tavern was erected in 1720 and used as a workhouse for the inmates. Opposite and erected in a mirror-symmetrical design there used to be an equally large building – the men’s prison. Today, only the ground floor level thereof is sustained, while the upper level was reconstructed and turned into a tavern from 1873. From 1873, the Castle experienced peaceful times. Instead of being a prison, it then served for touristic purposes. The workhouse was turned into a hotel, the barracks became a youth hostel, the men’s prison became a tavern and the main administrative complex a museum. Castle Leuchtenburg was supposed to be sold by auction in 2007. At the time, 60% of all buildings at the Castle were empty and in desperate need of repair. A concept for use did not exist. Establishing the Foundation Castle Leuchtenburg, Sven-Erik Hitzer started to father a new era of use. Extensive renovation work could be completed and the concept of setting up the Porcelain Experience allowed renewing and reviving empty and unused buildings. During its 800-year-old history, the Castle has luckily always been used, even though the purpose of use was not always delightful. But in fact, the all-time use has been a warranty for its preservation. And this even depicts today’s approach of preservation. A historic building needs utilisation in order to remain a witness that transcends the heritage as a ruin or an archaeological site. The best exhibition that we have ever seen in Germany! Sign up and receive our news, event information and tips every two months. Mandatory field Datenschutzerklärung* Ich habe die Datenschutzerklärung gelesen und akzeptiert.